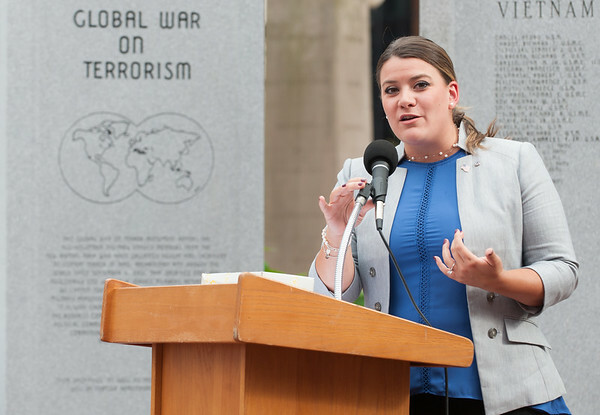 NEW BRITAIN – With heavy hearts but spirits high, city officials, residents and veterans helped dedicate the city’s new Global War on Terror Monument on Tuesday, the 17th anniversary of the Sept. 11, 2001 terrorist attacks. 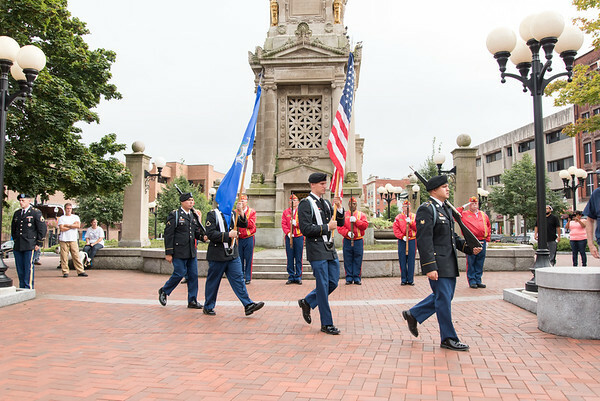 People in New Britain joined communities across the country Tuesday with ceremonies of remembrance to those that died in the 9/11 and thanks to those in the armed forces for their service. Members of the city’s Northwestern Veterans T.G.M. Memorial Post celebrated the culmination of years of fundraising and planning for the new monument. 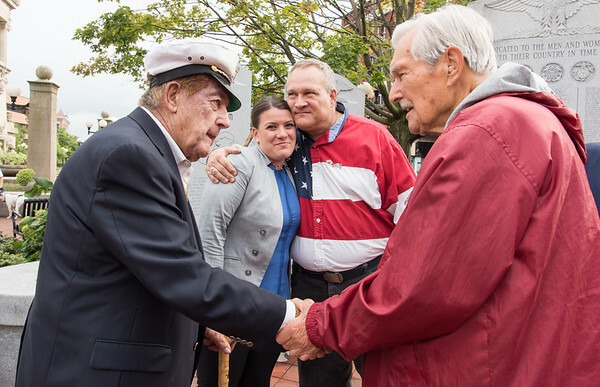 While the New Britain Memorial-Donald T. Sagarino Funeral Home agreed to donate the monument, the veterans group helped raised money for the monument’s foundation and other construction costs. Completed in August, the monument now sits alongside the Vietnam War, World War II and Korean War memorials. “When you look at this memorial, you’ll see that is it very similar to the other three monuments that stand here at Central Park. This Global War on Terror Monument is equally important – it honors the men and women who have served this country in difficult times. We must always remember that their service also significantly impacted the lives of their families,” said Post Commander John Navarro. Jonathan Raymond, general manager of the New Britain Memorial-Sagarino Funeral Home, said it was his pleasure to donate the monument. Raymond encouraged those in the crowd to respect veterans and continue to honor them in different ways. “Go up to a veteran and acknowledge their service to our country. Thank them, personally, for their sacrifice to our country. Thank them for your freedom, because without the small percentage of the American population that serves our country, we wouldn’t or might not be able to gather like this freely,” Raymond said. Mayor Erin Stewart thanked resident Dennis Taricani for his passion on getting the monument in Central Park. Stewart spoke about the city’s tradition of monuments across the city and why officials wanted to honor the country’s newest veterans, those that enlisted after 9/11. The project was approved by the New Britain Veterans Commission in January with the stipulation that a fifth monument on the right side of this area be considered in the future. The new memorial will be included in the city’s Veterans and Memorial Day services that take place in November and May. Posted in New Britain Herald, General News on Tuesday, 11 September 2018 20:26. Updated: Tuesday, 11 September 2018 20:28.